When parents talk about milestones, it’s often related to when their children talk, walk etc. The big developmental milestones. However, when you’re raising a child with autism the word milestones can take on a different meaning. Sometimes, we as parents can obsess over these milestones – especially the missed ones. Milestones come in all shapes and sizes and it’s important to remember – some are good and some are not good. For example, two weeks ago, we had some amazing progress at the gymnastics class MJ goes to. We all (including therapists) had been working with her on what to do in a few situations – like when she gets stuck in the foam pit, or when kids are too close to her. You see, MJ has been taking gymnastics for almost 3 years now. We started with the parent/toddler classes as a way to work on her social skills and because she is an incredibly sensory seeking (motion) kind of child. 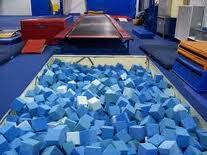 There is a foam pit where she takes gymnastics and most children don’t think twice about just leaping right in. However, MJ hated that pit from day one. Refused to go anywhere near it to the point I’d just sit on the sidelines somewhere with her in class until that portion of the class was over. Over time, we worked up to her standing beside the foam pit to taking the blocks and building towers. For over a year that was what she did. Her therapists then worked with her on some imagery to find ways to not be afraid. Eventually she envisioned she was a mermaid jumping into the ocean and it worked – we were so proud of her. However, she wouldn’t go in more than once a class and you could tell she got extremely agitated by it. What we finally figured out was that besides not liking all the bodies close to her in the pit, she didn’t know how to get out. She was really agitated by the idea of not being able to get out. We spent a lot of time working with her – her clinical supervisor added it as a hypothetical to one of her programs and they spent months working with her on what to do if she found herself getting stuck. You see for most kids, they would know to just ask, or put up a fuss until someone helped them. For kids on the spectrum, that kind of thinking doesn’t come naturally, it has to be taught. Two weeks ago, we achieved the unthinkable – I watched her take running starts and huge flying leaps into the foam pit. She would immediately tense, stop, turn around, take a breath and then ask her coach for help getting out. This action that most kids do without a second thought – was one of the biggest milestones we’ve seen from MJ in a long time – you can’t imagine how proud I was in that moment. Last week, we went in the opposite direction, after a rather difficult day, she didn’t display any of the same actions in gymnastics and by the end of the class, she was so agitated that we almost achieved another milestone of a different kind – a public meltdown. You see, MJ is not one to melt down in public she saves it all for behind closed doors. To be honest, I’m not sure this is a milestone we want to achieve, although our clinical supervisor says otherwise. Milestones come in all shapes and sizes, some days it’s getting dressed (or dressed without clothes inside out/not backwards) and other days they are bigger, like a new skill, or doing something they’ve never done before.